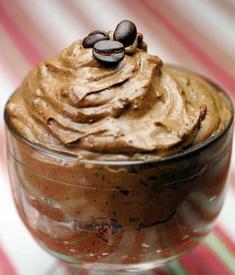 Try a cup of Coffee Mousse!! Boil 1 cup water and stir in the coffee powder. In a pan, mix the gelatin powder in 2 tbsp of warm water and stir this over another pan of hot boiling water till completely dissolved. Mix this gelatin into the coffee. Mix the condensed milk and cream into the coffee, blend thoroughly with a hand mixer. Refrigerate for several hours or overnight. Before serving swirl the remaining cream on top to decorate.